FUKUSHIMA PREFECURE, Japan – Two years ago on March 11, Hiroshi Kanno, 72, was fixing the roof of his garlic drying shed on his farm near the village of Iitate in Japan’s Fukushima prefecture when he heard what he called a sound in the earth that echoed off the jagged mountains whose trees were just beginning to show signs of spring foliage amid a light snow cap. Immediately he sensed an earthquake. He was right. “The buildings started jumping, my little truck started dancing and I was thrown to the ground,” he told Bellona in an interview on the second anniversary of the disaster at the Fukushima Daichii Nuclear Power Plant here in Fukushima City to where he was relocated. When it was apparent the worst of the tremors had ended, he jumped in his truck and drove to is farmhouse and fortunately found it still standing. But there was no electricity, or phone and mobile towers had been destroyed. He returned to the television he had in his truck to get information, and heard there was an imminent threat of a tsunami. The 9.0 earthquake off the coast of eastern Japan ultimately claimed 15,881 lives, and some 2668 still missing, the Japan Times reported Monday. 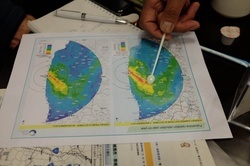 Some 160,000 were set adrift from Fukushima prefecture over the ensuing days due to radiation leaks. As Kanno was only 35 kilometers from Fukushima Daichii, he said his worries went directly on the fate of the nuclear plant. The 11-meter tsunami did come, and destroyed all power to the plant, leading to three reactor meltdowns and enormous cast-offs of radiation. “I was more worried about what would happen to the nuclear power plant than even cities,” he said. The next day brought even more bad news. He watched on his portable television as hydrogen explosions destroyed the reactor buildings of the Fukushima plant’s reactor Nos 1, 2 and 3, signaling meltdowns. He also worried for the fate of Fukushima prefecture’s other nuclear power plant, Fukushima Daini, which switched off during the quake. “Had both plants gone, it would have taken half of Japan,” he said. Two years later, he and 6,200 other residents of the centuries-old Iitate village are still unable to return home. Residents of the village, which was directly in the path of the fallout, have been scattered across the country. Some, like Kanno, were given government plots to continue farming outside the affected area, and have been able to sustain a meager lifestyle. 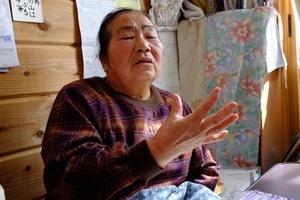 Others like 76-year-old Eiko Kanno, who is distantly related to Hiroshi, were not so lucky, and have been forced to live in tiny apartments in pre-fabricated industrial evacuation communities, separated from family and the lifestyle their elders taught them. 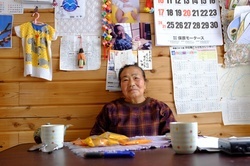 This shrewd-eyed septuagenarian grandmother, who is as easily moved to ribald laughter as she is to tears, now lives in an evacuee encampment of 87 other residents of Iitate located in the Date Region of Fukushima prefecture. Situated down a gravel road behind an abandoned school, her two-room apartment among the wooden shacks has separated her from everything she knew and loved for seven decades. The knickknacks and keepsakes overflowing the cramped space as she entertains guests are testament to a life abruptly displaced. She has been living in the tenement housing for a year and 10 months, waiting for assurances from the government that it is safe to move back home – but also not trusting calculated timeframes issued by authorities. Indeed, according to Hiroshi Kanno, the 6,200 residents of Iitate were house in only 1,700 households, which is indicative of the multi-generational lifestyle of many small Japanese villages that were dissipated by the nuclear calamity. The once idyllic community has been thrown into the diaspora by an industrial disaster of radioactive proportions that it had barely anticipated or invited. Some 30 percent of evacuees now live as Eiko Kanno in encampments throughout nine separate districts. According to Hiroshi Kanno, the federal government says it will be safe to move back into Iitate when radiation reaches 20 milliseiverts per year, but both he and Bellona’s nuclear physicist and general director Nils Bøhmer agreed that such a measurement was far too high. Both Kanno and Bøhmer, who is in Fukushima with other Bellona staff for the anniversary of the disaster, cited that Belarus and Ukraine, which bore the brunt of fallout from the Chernobyl disaster in 1986, established that one milliseivert per year constituted it was safe for displaced residents to move back to their homes. “Ukraine and especially Belarus are not known for their nuclear safety, so the establishment of the one milliseivert factor is amazing in comparison to what the nuclear savvy government of Japan is proposing,” said Bøhmer. He said the normal natural background radiation for Norway, which has no nuclear power plants, is four milliseiverts per year. Exposure to levels of radiation as those proposed by the Japanese government to displaced residents of Iitate can lead, over time, to various cancers, Bøhmer said. 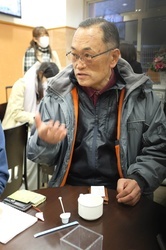 Before becoming a farmer Hiroshi Kanno served for 39 years in Iitate’s local administration overseeing various environmental regulations such as water and air quality, so was in a unique position of understanding on 3/11, as it has come to be known in Japan. “My immediate concerns were for evacuation of the village and I expressed those concerns to my former colleagues,” in the Iitate mayor’s office, he said. “But no government order for evacuation came until April 22,” 43 days after the disaster. He also cited that there was a general blackout of information about how much radiation was flowing from the plant, which put the lives of the 160,000 people who were eventually evacuated in peril. He finally had to evacuate Iitate with his wife of 62 and his 87-year-old mother. He told Bellona that he could never return permanetly to his farm in Iitate, which produced carrots, ginko nuts, radishes and garlic. He does return, however, five days a year to collect his ginko harvest – the longest time radiation levels allow him to be in the area. “In no way is the government living up to the need of the people of the Fukushima region,” he said. In order to maintain some modicum of the past, Eiko Kanno spent Sunday making Iitate’s distinguished blend of miso soup with her evacuee neighbors. “We sang and laughed and remembered how it used to be,” she said. But she added that is heart-rending to depart a family history in the Iitate village that dates back four centuries for her and her people. “I always thought that I would grow older there and that my ancestors would too, but now we are waiting for the forecast of scientists,” she said. According to Bellona’s Bøhmer, it could take as long as 50 years for the Iitate area to be restored to a safe level of one milliseivert per year of background radiation – far beyond when Eiko would be able to enjoy the homecoming. In Eiko’s words, an idyllic continuity of culture and tradition has been wiped out by the advance of the nuclear industry, which is now more unwanted than ever. She nonetheless maintained some hope that the nearly unsolvable difficulties would take a turn for the better. Hiroshi Kanno doesn’t hold any hopes for the future of his former home. Both Hiroshi Kanno and Eiko Kanno were against the current Japanese government’s current plans to phase nuclear power back in. Ever since the Fukushima disaster, all but two of Japan’s 50 reactors have been in operation. “Nuclear power plants that destroy nature we were given by God should not be restarted,” she said. This is the second in a series of stories by Bellona on the second aniversary of the Fukushima disaster.